When someone hears the term 20/20 vision, it is generally understood that reference is being made to the presence of normal or sharp vision – in other words, someone had an eye test and does not need glasses. From a more technical standpoint, 20/20 vision means that the person can clearly see at 20 feet what they should normally be able to see at that distance. Unfortunately, when the subject turns to measuring hearing loss or clarity, the general public might not be as well informed, or as diligent, as they are with assessing their sight or vision. People will make casual references to seeing an eye specialist or going for an eye exam, but might often express concern or uncertainty about having a hearing test. Perhaps this trepidation is in reaction to a suggestion or recommendation that they need to schedule an audiogram? After all, this is a somewhat technical term that might not be readily understood (they usually put drops in your eyes for an eye test but what do they give you for an audiogram?). Based on the above progression of hearing impairment, and an acceleration in frustration and lack of enjoyment of everyday activities per level, any suspicion of hearing impairment should be addressed with an appropriate urgency. This is done by scheduling a hearing test with a Toronto hearing clinic such as Bravo Hearing Centre. Treatment should be sought as soon as possible if any impairment is suspected. This would begin with a visit to a hearing test centre, where one of their specialists can perform a free hearing test. The results of that test, shown on an audiogram, will determine the next steps, and specifically whether a hearing aid will be required. Bravo Hearing Centre provides a complete range of hearing products and services including hearing tests and counseling with professionally-trained hearing loss specialists. 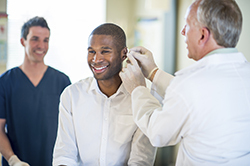 to schedule a free hearing test and to determine the next steps in the course of treatment. An audiogram refers to a printed record of hearing test results that help hearing loss specialists assess how well a person hears different types of sounds, whether there has been any hearing loss, and the extent of that hearing loss (frequency range).